Now that we’re in maple-sugaring season here in the Northeast, I’ve been thinking about its history. Maple sugaring has a distinctly North American, and Northeastern, history that goes back well before European explorers first recorded the practice among the Cree, Algonquin, and Iroquois tribes in the early 1600s. In the north, where winter lingered long enough for warm days to alternate with freezing nights, Native Americans sliced into the bark of the sugar maple tree and collected its sap in birch-bark or hollowed wood containers. They, and the colonists they taught, knew that if they could get rid of enough water in the sap, they’d be left with a hard, sweet solid — maple sugar, which was easy to carry and to store. Self-sufficient North American cooks sweetened with maple sugar right up until the Civil War. But how did Native Americans know to tap trees for their sweetness? Just possibly they learned by watching another self-sufficient North American, the red squirrel. This small and feisty rodent found in northern forests across the continent makes most of its meals from coniferous trees, a preference that gives it one of its nicknames, the pine squirrel. Red squirrels pull apart the cones of evergreens (they especially like spruce) to eat the seeds, creating piles of pine scales, called middens. To make it through its first winter, a young red squirrel has to collect enough pine cones to fill four to seven bushel baskets. Maybe by the time winter is drawing to a close, the red squirrel is ready for something new — or needs to find a new source of food. New England naturalist and writer Bernd Heinrich has observed red squirrels biting through the bark of maple sugar trees (also other maples, birches, even apple trees). The grooves made by the squirrel’s incisors act like tap holes. The squirrels that Heinrich observed didn’t try to drink the sap water. Instead, they waited for the sap to evaporate. Then the little maple-sugarers made the rounds of their sugarbush to lick off the maple sugar that had dribbled down the tree trunks. Naturalist Heinrich came upon a Native American legend in which a young boy discovers maple syrup by watching a red squirrel, which may be as close as we’re going to get to knowing how humans learned to find sweetness in trees. We do know that only about one of every five red squirrels survives its first winter. That hard season is almost over by the time sap starts to run, so any red squirrel that laps up maple sugar is tasting victory. 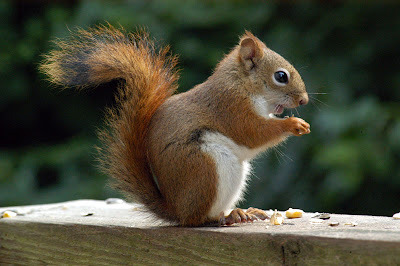 Learn more about red squirrels.